Ebihen 16 is a lengthened version of Ebihen 15. As such, she is a seaworthy, stable boat with good carrying capacity, it is suitable for family sailing, as well as fishing. She offers a big and pleasant cockpit. She was inspired both by the fishing boats of Northern Brittany, especially Saint Jacut (the Ebihens are the islands in front of that port), and by the boats of Basse-Normandie, which were clinker built. Four different rigs may be chosen according to your specific needs, from the very simple lug sail to the well-canvassed gaff cutter (see drawings). It is also possible to choose a lug yawl rig or a “flambart” rig. Ebihen 16 is fitted with a metal centreboard and a water ballast (180 litres) that allows excellent stability and good windward ability. A well for the outboard motor is built aft of the cockpit, with the motor handle at helmsman reach. The propeller is just ahead of rudder for good manoeuvrability. A 4 strokes – 3 to 6 hp – motor may be installed. Ebihen 16 can be built and stored during winter time in a common garage. It is of course trailerable. The first boat of the series was strip-planked, with laminated frames and backbone, and almost no plywood. It is a beautiful wooden construction. 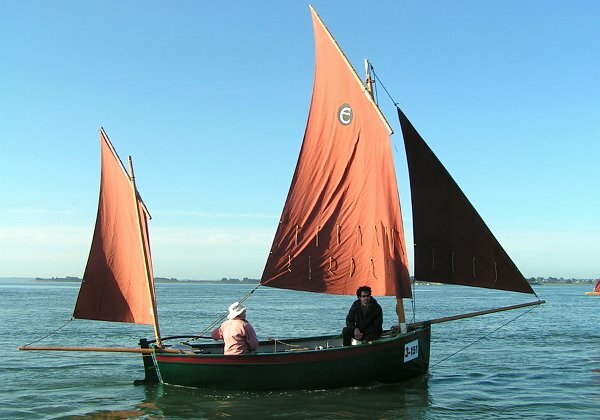 The clinker version is mainly made of plywood, for the hull planking but also backbone and transverse bulkheads, then much more easy to build by a first-time amateur. The strip planked version is built from a dedicated plan package. The study plan is common for all construction modes and rig versions of Ebihen 15 and 16. The building plan is common for all rig versions of Ebihen 16: standing lug, “bourcet-malet”, gaff sloop, gaff cutter. Attention: building this boat requires also full size patterns, or a numerically cut plywood kit.